Home,Family and Future for Homeless,Familyless chilren and Women in distress. 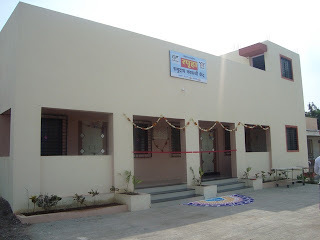 The inauguration of newly built wards for Snehalaya's hospital of HIV positive patients held on 21st, December 2009 by the auspicious hands of Dr. Mrunal Shete (Director, Karnataka Health Promotion Trust, Pune) and Dr. Madhav Munde (District Civil Surgeon, Ahmednagar). The renowned medical professionals, well-wishers of Snehalaya, staff of all projects and beneficiaries especially women in Prostitution, representatives of network of people living with HIV was present for the programme. Snehalaya is running 20-bedded hospital since last two years exclusively for HIV positive patients. The patients from all over Ahmednagar district are coming to our hospital for reliable treatment on opportunistic infections as well as pretest and posttest counseling on HIV/AIDS and STI (Sexually Transmitted Infections). The patient is being admitted in our hospital for 5 to 14 days, in this period the patient has to go under all the necessary tests, like CD4, sputum, HB etc. the trained counselors used to counsel them on the various topics like home based care, social stigma, STI, sexual life, harassment by the society, relatives etc. The Medical Officers in our hospital registers the patients for ART (Anti Retroviral Treatment) in ART Center in the Civil Hospital, where the patients can get the free medicines of HIV/AIDS. Additionally our Outreach Workers take care that patient should not discontinue the treatment. Our hospital is getting overwhelming response and we did not have sufficient space to admit the patients in our hospital. This need made us to build new well equipped hospital for 20 more patients (10 male and 10 female). In this project the Netherlands based trust 'Stichting Geron' offered financial assistance for the construction of the hospital. Snehalaya is always grateful to Dr. Nicolas Nobel, Mrs. Annakoos, Mr. Bastian and Dr. Marlous Kortekaas of Stichting Geron for their kind help in the humanitarian work of Snehalaya. Snehalay has named this building as 'Dr. Nicolas Nobel Complex'. Dr. Mrunal Shete appreciated the efforts of Snehalaya for treating the patients with HIV/AIDS without any kind of discrimination and congratulated Dr. Nilesh Parjane, (M.O. of Snehalaya's Spruha Community Care Center) and his team for selfless service. Dr. Munde assured to extend all kind of support to our hospital on behalf of Civil Hospital (Govt. Hospital in Ahmednagar). Dr. Ravindra Somani, renowned surgeon donated 22 cots and Dr. Nilesh Shelke donated 6 cots for patients at this juncture. Dr. Suhas Ghule, well-known radiologist and trustee of Snehalaya has given the vote of thanks.